Pamper yourself with refreshing prayer! You’re stressed out, you’re multitasking, and you’ve got a prayer list as long as your arm. But when do you have time to pray for you? Printed in a compact size with a spa-themed cover, this book makes a wonderful gift for wives, mothers, sisters, and any woman who needs a boost in the spirit. Julie’s transparency and blunt honesty are captured in 52 hope-filled vignettes, one for each week of the year. As I read it, I personally couldn’t wait a week, so I read one per day to start each morning’s prayer time. Julie explains in the beginning how a flight attendant’s speech reminding parents to place the oxygen mask on children first served as her wake-up call. Knowing she’d probably fix her child’s oxygen mask before her own, she was startled with the Holy Spirit’s promptings: You need to begin to pray for yourself. Julie’s prayers had revolved around taking care of everyone else first. But with a struggling marriage pounding on top of everyday pressures, she was stressed out to the max. It was time to put on her own oxygen mask. In the book, each of 52 concise devotions shares a specific vulnerable experience, pearls of truth, relevant scriptures to encourage and pray, and a prayer to refresh and strengthen women. It is well-written, gut-honest, and relatable to today’s Christian women. I loved it! 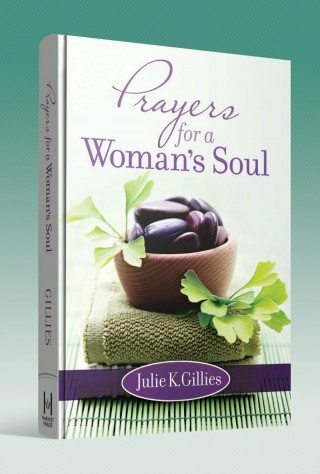 Prayers for a Woman’s Soul would make a wonderful Mother’s Day gift. I’d ask for one myself, if I didn’t already have a copy tucked beside my Bible waiting for tomorrow’s devotions.